It’s time for marketers to get over themselves. To forget about sales and their product, and focus on one thing: the customer. Read how MarketingSherpa Awards Best-in-Show 2017 winner Dan Briscoe and his 22-person team at HCSS launched a customer-as-the-hero campaign that in the first eight months, drove a 53.6% increase in annualized revenue. 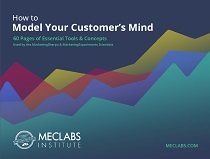 HCSS’ campaign was chosen as the Best-in-Show unanimously by our judging panel, comprised of content, data, marketing and testing experts from MarketingSherpa and its parent company, MECLABS Institute. This is because they made customers the true hero of the story, instead of products and services. Although Briscoe admitted in his submission that it was a constant struggle throughout the campaign, the results are undeniable. Briscoe will be presenting this campaign on-stage at MarketingSherpa Summit 2017 April 10-13 in Las Vegas. Last year, Dan Briscoe, Vice President of Marketing, HCSS, ran a transformative campaign called “I Build America,” which showcased current customers in a March Madness-style competition. This year, they decided to grow the audience a little wider – to the entire construction industry. “We're trying to attract the next generation into construction. And in some sense, we're trying to reach all of America,” he said. A lot of our country’s infrastructure was built back in the '40s with a 50-year lifespan, and is starting to need replacement and repair. That changing perspective on construction from the general public wasn’t the original purpose for this effort, but this campaign has grown far beyond the original goals in almost every other area as well. Originally, the idea was to, “simply put, to get over ourselves. To quit the sales and marketing obsession to focus only on our company, to talk only about ourselves, and to quit trying to show how innovative our products are and how beloved our customer support is across the industry. Nobody really cares, and when they do care, they don't want to hear it from us,” he said. Funnily enough, he added, since they stopped focusing on sales, each quarter sets a new record. The marketing team has doubled, and the focus on the customer as a hero has had a permanent imprint on company culture. Briscoe and his team noticed more of an opportunity than a challenge in this campaign. They saw a need from customers shining through the success of past ‘customer as the hero’ campaigns, that could be built upon. “Our customers in the construction industry are struggling to find and retain good employees … a career path in construction is not viewed favorably by teens, parents, and school counselors. Even in college, civil engineering isn't viewed as favorably as other engineering fields, even though the pay and opportunities are often higher,” he said. The goal was to help construction improve its image and attract the next generation of workers while simultaneously helping HCSS become a major voice in the industry it has been a part of for 30 years. “Our CEO [Mike Rydin] wanted to give back, and it always bothered him that the industry that he loved, that the public didn't have that same perception of them and he saw an opportunity to help,” he said. There are a lot of people who have “good websites that showcase the logic of construction, dollars and cents, why you should go into it, why it makes sense, why the public should value it,” Briscoe said. However, HCSS wanted to highlight the human element of going into construction. “The logic is still good, but we can use marketing and videos and websites and social media to really show people the human side of it and the real value and the impact,” he said. Briscoe and his 22-person team put together the “I Build America” campaign with the tagline, “Pride. Respect. Construction” that has seen several website iterations, project awards, an ambassador program, meaningful social media and content production and giveaways. This all began, Briscoe said, with the Most Interesting Project campaign, (a MarketingSherpa Reader’s Choice nominee case study last year) where he saw the customer base sending in compelling content, and enjoying the process. “It gave us a great deal of confidence,” he said. When the CEO spoke to Briscoe and Skylar Moss, Director of Digital Marketing, HCSS, about making a positive impact of the industry, and how it had been a dream of his for a decade or so, it gave them the confidence to go after it. After initially jumping into it, the project was presented to the executive team, he said, and a launch was planned for the HCSS User’s Group Meeting, attended by about a thousand people, at the end of January – with only a couple of months to get it started. “In those couple of months, we launched an entire website about it. We launched a clothing line, an ecommerce site. We did all the branding, developed stickers, started engaging on social media … We went on two locations and shot video and did interviews and created the I Build America videos in that two or three months, getting ready for launching a users' group meeting,” he said. The success of the Most Interesting Project competition was turned around and renamed the Construction Impact Awards. “It was still a competition, still had many of the same elements, but instead of talking about interesting projects, we wanted companies to tell us the impact that their project had on America. That was the competition,” he said. This fit into the new “I Build America” theme, although the competition had the same judging panel and popular voting mix to choose the winner. They named four winners, and plan on shooting I Build America videos with each, to post to the website and be shared. Another initiative was the Construction Intern Awards, where the company offers $50,000 in scholarships. HCSS is currently in the second year of this contest where entrants submit the stories of their construction internships. Last year’s grand prize winner, Chase Ekstam, is a Construction Management major at Missouri State University. He wrote about his internship, and the passion for the heavy civil construction industry that lead him to pursue it through to higher education. “We've also been focused on the product marketing and helping the company grow. So it's always a battle between . . . our company is having record revenue, so we're stopping to do that and continuing to improve product marketing while we have this whole movement going on,” Briscoe said. It's been difficult to juggle helping the sales team, while also growing the I Build America project, he said. 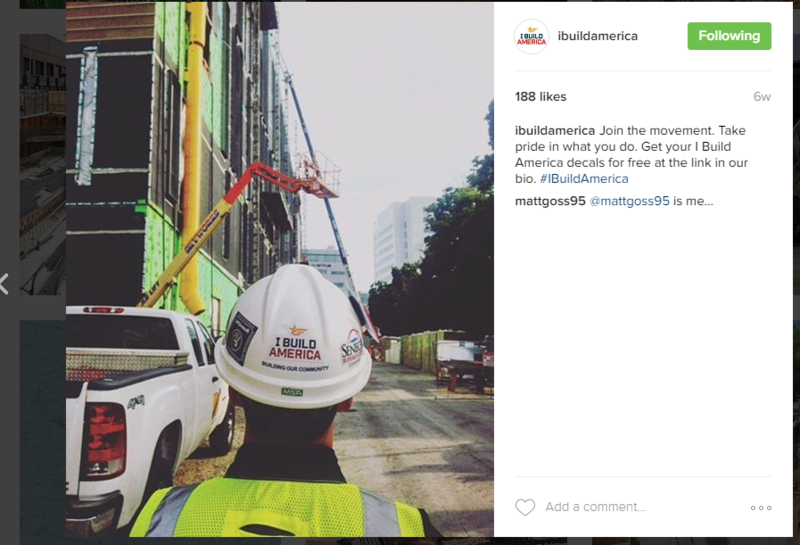 Launching I Build America and building a movement is only one of the projects our marketing team is tackling this year. “We also took over the recruiting department, we are helping implement a new accounting system, CPQ tool for sales, ATS system for recruiting, a new account management team, and an online HCSS Academy to scale our software implementation team,” he said. The top priority is to help the sales team scale by moving more of the sales process to marketing with better self-education with online content, Brisco said. “We had an eight-person sales team that really relied on online demos, hour-long demos, sometimes multiple demos to work a construction company through the sales process,” he said. Expanding the team to 22 people has been a huge help, he said. They are all focused on pushing out content to serve these different objectives, and for the sales process alone, need to produce A/B tests, nurture pathways, videos, webinars and interactive demos. The I Build America site produces blog posts and articles that focus on projects and topics that concern the construction industry, or have even been submitted by supporters. To balance, the team focuses in two week intervals, and reassesses in every quarter. “We do a [retrospective] at the end of every two weeks and adjust, and then move forward to the next two weeks. We probably couldn't have done this without a really bright team. We've got great marketers that think like entrepreneurs and take ownership, team leads and directors that really push us and keep us aligned. And then we've got an executive team that supports us,” he said. One way the team serves both the sales team, and the I Build America project, is by cultivating one of the latter’s greatest assets – the people passionate about the construction industry. The team noticed that there were a lot of people that liked to post about construction on social media, and some of them frequently and with a passion. “We've engaged with them and created kits that we could send them with hats and stickers. So we've started to make ambassadors out of them. They're posting every day on social media some of the interesting projects they're doing, spreading the stickers,” Briscoe said. At this point, he added, there are organizations and school groups that approach them asking about elements like the stickers, “so it's starting to become an industry term, which is exactly what we wanted,” he said. 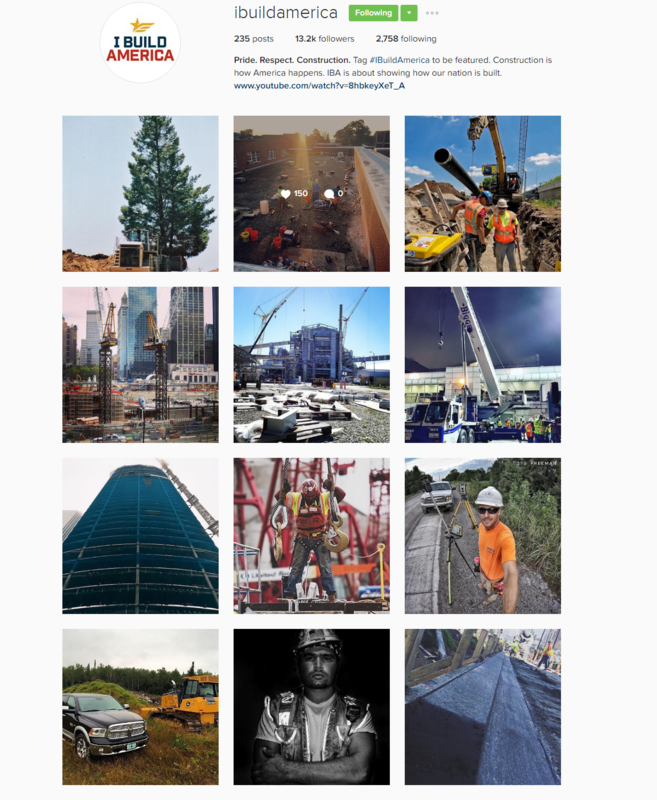 An intern on the marketing team keeps an eye out for people who are extremely active in the construction social media sphere, and will reach out to them with an offer to send a kit with a hat and some stickers. It’s gotten to the point, he said, where they have developed a store for products, so that people can easily purchase the campaign elements they’re looking for. “That's part of the pride part. We did all that ourselves. We developed the branding. We found a clothing line,” he said, adding that they’re even about to launch some certified high visibility safety clothing, branded with I Build America. Through contest entries, Briscoe and his team find stories where they can feature interesting people or projects in construction through video. They also work through relationships with associations in the construction industry, he said. “We've talked about I Build America at the [Associations of General Contractors] event, their national meeting,” he said. 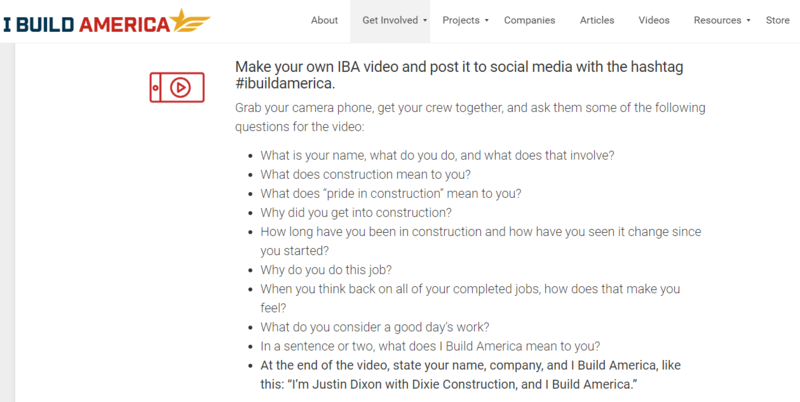 There is also a form on the website where companies, individuals and supporters can add themselves to a directory, as well as submit projects to be featured on the I Build America website, and be considered to be developed into a video. 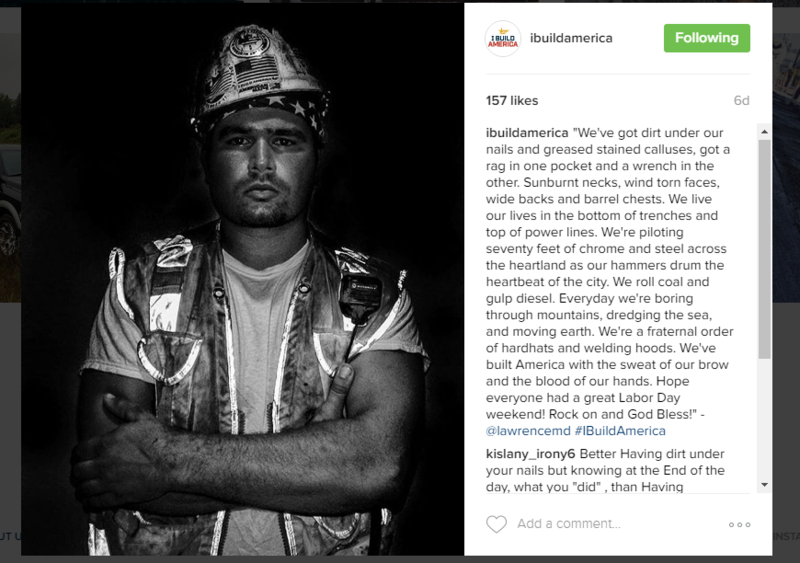 They are also encouraged to make their own video, and post it onto social media under the hashtag #IBuildAmerica. 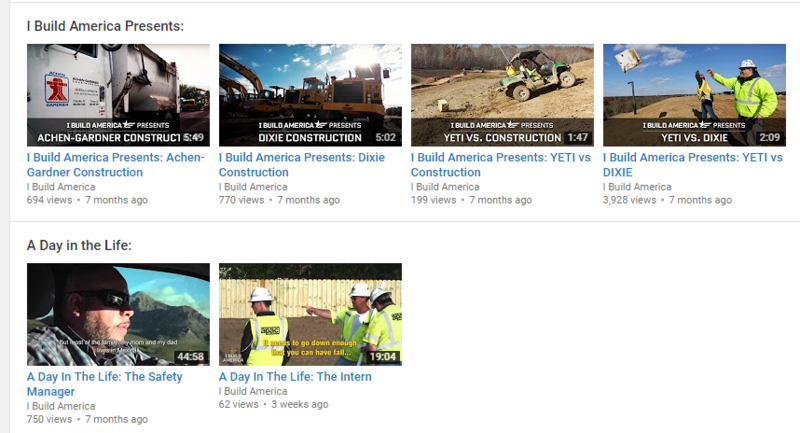 The team develops videos that focus on specific companies’ projects in the “I Build America Presents” series, and specific people in the, “A Day in the Life” and “People of Construction” series. These videos range from under two minutes, to over 40. In the first 8 months of the I Build America project, Briscoe and his team created several iterations of the website, a social platform, clothing line and gifts, ambassador program, and a project contest. From there, they are currently working with “several of the largest construction associations in the country, working with the military to add this to their exit training for veterans, launching a non-profit arm, building high school recruiting kits, doing fund-raising, and much more,” he said. They are currently engaged with the state of Wyoming to help show the pride and value of construction to the state, and reach the young population with that message. This involves collaborations with high schools, community colleges, trade schools, the state contraction association and major construction companies operated out of the state. The team is even in initial conversations with the military, and is developing content and curriculum that could be used as training about construction to help veterans transition out of the military. By February 2017, Briscoe anticipates I Build America should be the leading initiative in the country for awareness around construction. Now, he said, they know the I Build America movement is in full swing, since they’ve just had their first customer sign up and give $1,000 to be a founding member. “Our goal is to get 1,000 customers to do that on an annual basis so we can take that money to build recruiting kits and continue to shoot videos and create tools and reach the general public,” he said. There are a lot of associations and groups attempting similar efforts across the country, and “we don't want to exclude them,” Briscoe said. HCSS wants to reach out and see if they can join forces to give back to the industry. “We've got seven products and the reason that we have the funding to do all this is because those products were doing well, construction companies, they've kind of grown up and they're looking at how can we use technology to work more efficiently,” Briscoe said. Customers sincerely appreciate the new approach, and the time and expense being put into recognizing the impact the construction industry makes on America, Briscoe said. This focus on making the customer the hero, he insisted, will work in any industry. It’s just a matter of finding and highlighting the human aspects for your customers. Construction is the perfect example of how, “if you're able to focus on your customer base and what matters to them, you can really engage with them and big things can happen,” Briscoe said. It’s your turn to vote on the campaign you think deserves the title of Readers’ Choice Award. Review our four finalists, and the campaign with the most votes will be asked to share its story as a featured session on the main stage at MarketingSherpa Summit 2017 in Las Vegas.